Angeles is a Yoga Inspired Artist, Registered Yoga Teacher and practitioner. Simplicity, vivid colors, and geometric compositions define Angeles’ art along with influences from her graphic design work. Consistent yoga practice gave a more profound significance and a fresh inspiration to her artwork. 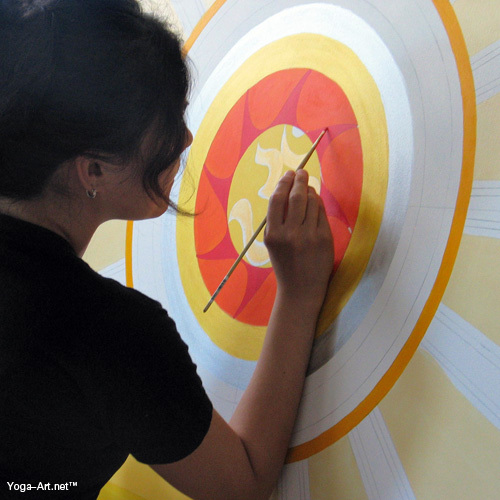 Seeking a deeper understanding of the disciplines at the core yogic principles, in 2008 she completed the Yoga Teacher Training Program at the School of Yoga at Mount Madonna Institute and started teaching at the Downtown Yoga Shala where her Yoga Inspired Art is on permanent exhibition. In 2012 she completed the Bheemashakti Yoga Intensive at Ginseng Yoga and, in 2013 she started practicing Ashtanga Mysore style with Adarsh Williams. She completed the Primary Series Teacher Training with Tim Miller at the Ashtanga Yoga Center in Encinitas, CA and currently teaches at the Monterey Yoga Shala. To capture and (re)express the many universal, positive messages from this ancient philosophy, the canvases began to fill with the Spirit of Yoga. Each one of these inspiring teachers have influenced my life and my devotion for the Yoga practice. Thanks to: Isabel Solana – Kundalini / Fedora Fonseca – Kundalini / Ayesha Estrada – Iyengar / Yvette Ai – Integrative Yoga / Zuby Pradhan – Integrative Yoga / William Osmer – Vinyasa Flow / Lirio Ohlson – Dynamic Hatha / Baba Hari Dass – Traditional Ashtanga (Raja Yoga) / Mangala Norskog –Traditional Ashtanga (Raja Yoga) / Ginger Hooven – Traditional Ashtanga (Raja Yoga) / Bhavani – Pranayama / Yuko Anupama Matsuda – Traditional Ashtanga (Raja Yoga) / Muneesh Rudin – Traditional Ashtanga (Raja Yoga) / Malena Blasini – Iyengar / Adriana Penia – Iyengar / Stephan Brodsiak – Iyengar / Veronica Cruz – Ashtanga Vinyasa / Julie Wiltshire – Vinyasa Flow / Matece Skow – Vinyasa Flow / Bob Riccomini – Vinyasa Flow / Jeffrey Lang – Vinyasa Flow / Elena Milyukova – Iyengar Flow / Jennifer Prugh – Vinyasa Flow / Prajna Brianna Vieira – Bhakti Yoga / Emily Lounsbury – Vinyasa Flow / Claire Farwell – Power Yoga / Ashley Lopez – Vinyasa Flow / Tim Meissner – Vinyasa Flow / Emily Weinberg – Bikram / William Auclair – Bikram / Sarah Sanders – Power Yoga / Kendra Shaila Fried – Power Yoga / Ani Silva – Vinyasa Flow / Stacey Johnson – Vinyasa Flow / Mia Hurst – Vinyasa Flow / Tyler Langdale – Vinyasa Flow / Jonathan Patriarca – Bheemashakti Yoga / Laxmi DeLeo – Vinyasa Flow / Jano Galindo – Vinyasa Flow / Laura Dasi-Downing – Vinyasa Flow / Bonnie Saldivar-Jones – Vinyasa Flow / Jennifer Oh – Vinyasa Flow / Vinyasa Flow / Kyonghwa Kim-Nobis – Ashtanga Vinyasa / Adarsh Williams – Ashtanga Mysore / Heleen Williams – Ashtanga Mysore / Natasha Teran Casabianca- Ashtanga Mysore / Holly Morrison Gastil – Ashtanga Mysore / Atsuro Chiba- Ashtanga Mysore / Tim Miller – Ashtanga Mysore & Ashtanga Vinyasa.